Finger limes, are also known as �the caviar of citrus� to top chefs worldwide! These unique finger size pieces of citrus fruit are probably more familiar to our friends �down under� in Australia from where they originate. The small, round, firm, �cells� of pulp inside the fruit do resemble caviar, and even burst open when bitten. They can and are used like caviar on top of sushi and is a favorite garnish topped on oysters. The lemon-lime flavor lends itself to many other recipes (i.e. cocktails, salads, curries,) as well as being used in marmalades. So the next time you want to make a big impression with your culinary skills, maybe you should... �let your fingers do the walking� with finger limes from Pearson Ranch. When are Finger Limes available? 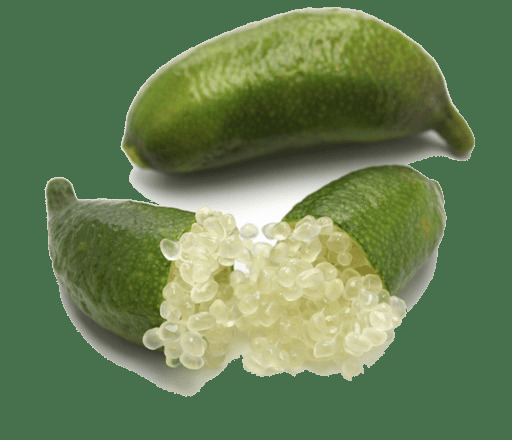 **Finger Limes are (typically) available most of the year HOWEVER...due to high demand of Finger Limes, your order will be shipped to you based upon their availability at the time you place your order. Call Pearson Ranch at 1-888-667-2643 for more information. Copyright © 2019 PEARSON RANCH LLC.